The Tudors are a national obsession. But beyond the headlines, and deep into their past, is a family still more extraordinary than the Tudors we thought we knew. Tudor history typically starts with the Battle of Bosworth and really picks up with Henry VIII and Anne Boleyn. But the real Tudor story starts earlier, with an ordinary man called Owen Tudor falling into a Queen’s lap, and later her bed. It continues with the courage of the pregnant thirteen-year-old Margaret Beaufort, the childhood and painful exile of her son, Henry Tudor, his rivalry with Richard III, and the disappearance of the princes in the Tower which heralded Henry’s rise as the first Tudor king. Henry VIII, his six wives and wider family are given a fresh perspective in the context of this past, and the reigns of Mary and Elizabeth Tudor are revealed in an unexpected light. 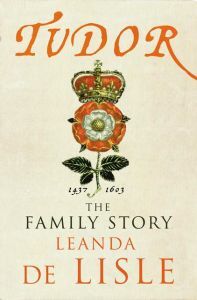 ‘Tudor’ presents a family struggling at every turn to establish their right to the throne, dominated by remarkable women doing everything possible to secure influence and their line. Packed with new revelations, this is the story of the Tudor family behind the myths.